The original iOS dice roller is back! Pip 3 gives you blazingly fast, true random dice rolls, for role-playing games like Dungeons & Dragons® or Fate™, and tabletop games like the Yahtzee® dice game. Shake the device or double-tap any empty space in the page to roll. Tap a die to lock it, tap it again to unlock it. Locked dice will not roll. Tap any empty space to unlock them all. Move dice around with your finger or fling them against each other. 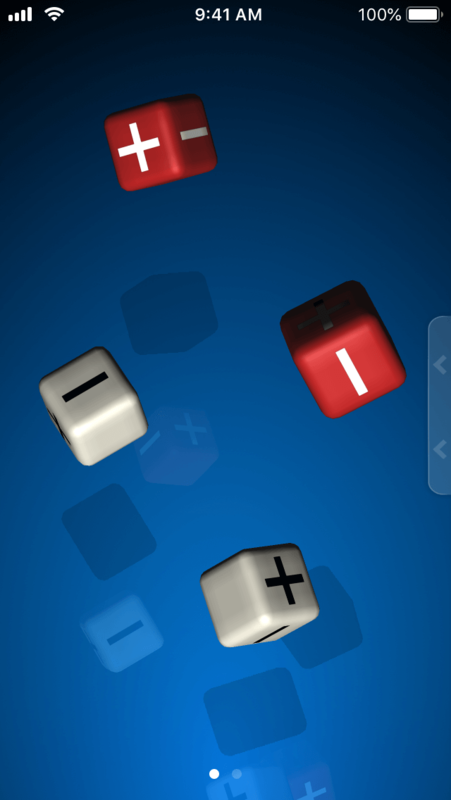 Tilt your device right or left to slide dice on the page. 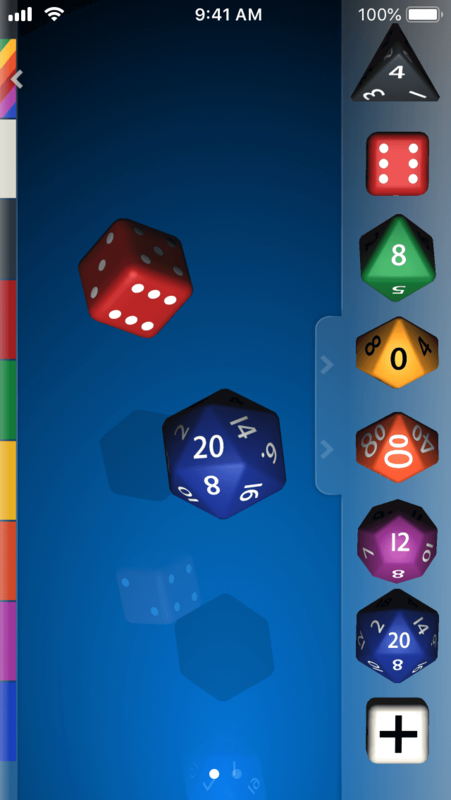 Slide the tab on the right side of the screen to access a tray with different types of dice, including classic role-playing and Fate/Fudge Dice™. Drag them out of the tray to add them to the page. 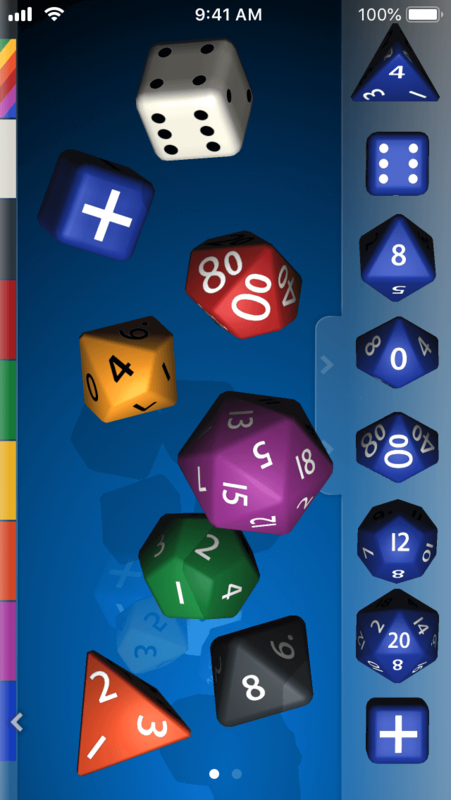 You can have any combination of up to 20 dice on a page. While the tray is open, choose from a selection of eight vibrant colors on the left side of the screen. To delete dice from the page drag them back into the open tray. Close the tray by sliding the tab back towards the right. Create up to 20 pages to save different dice combinations on each one of them. To create a new page, with the tray closed slide left from an empty space on the last page. Move between pages by sliding right or left from any empty space while the tray is closed. Delete a page by deleting all the dice on it, and then moving to a different page. Pip doesn’t feature dice formulas, logs, or automatic dice roll result calculations. Pip is not a game on its own! It is a physics-based dice simulation for games you already own. DUNGEONS AND DRAGONS® and D&D® are trademarks of Wizards of the Coast LLC, a subsidiary of Hasbro, Inc., in the United States and other countries. Pip is not affiliated with, endorsed, sponsored, or specifically approved by Wizards of the Coast LLC. YAHTZEE® is a trademark of Hasbro, Inc. in the United States and other countries. Pip is not affiliated with, endorsed, sponsored, or specifically approved by Hasbro. FATE™ and FATE DICE™ are trademarks of Evil Hat Productions LLC, in the United States and other countries. Pip is not affiliated with, endorsed, sponsored, or specifically approved by Evil Hat Productions, LLC. $1.99 (USD) | 2.29€ (EUR). iOS 8.0+, iPhone 4s and up, iPod touch 5th generation and up. Pip 2 works on the original iPhone and up, iPod Touch 1st generation and up, iOS 2.0+.